This dinner is perfect for those warmer months. Perfect to cook on the barbeque or grill plate, this lemon and mustard flavoured chicken tastes delicious with a little bit of char. With a healthy serve of vegetables, it is spot on served with a crisp, local lager. Go on, treat yourself and share the moment #youplateit with us on Instagram or Facebook. Turn on the BBQ (if using, alternatively turn on the oven to 220°C). Wash the fresh produce. Peel and mince garlic. Pick parsley leaves, discarding stems, and roughly chop. Zest lemon and cut in half. In a bowl, combine lemon zest and juice from ½ the lemon, dijon mustard, garlic and parsley and chicken thighs. Toss well to cover and set aside for chicken to marinate while preparing remaining ingredients. Remove corn husk and silks and cut into 2 or 4 pieces (if cooking corn in the oven, wrap in a piece of foil, topped with butter). Trim squash and cut into quarters. Slice tomatoes in half. Trim woody ends off asparagus (and discard ends). Add corn to BBQ (or oven, wrapped in foil) and roast for about 8-10 minutes until tender, turning regularly to avoid burning. At the same time, grill squash and asparagus spears for 1-2 minutes per side, cooking in batches if necessary. Season with salt and pepper and remove from heat. Set aside, covering to keep warm. Leave BBQ on. Add the chicken (discarding remaining marinade) to the hot BBQ/grill plate (or hot pan on the stovetop) and cook 5 minutes before flipping. Flip and continue cooking for another 5 - 7 minutes , until the chicken is cooked through. Remove from pan and slice into 3cm chunks. Cut remaining lemon half into wedges. On a large platter or bowl, toss together rocket and spinach leaves with grilled squash, asparagus and cherry tomatoes. 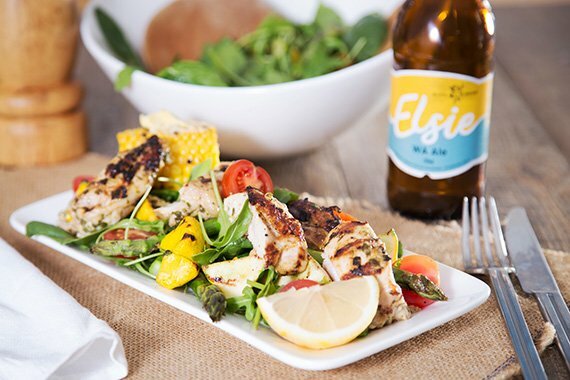 Top salad with grilled chicken pieces and serve corn alongside, topped with butter, salt and pepper. Garnish with lemon wedge and enjoy with a crisp, local lager.